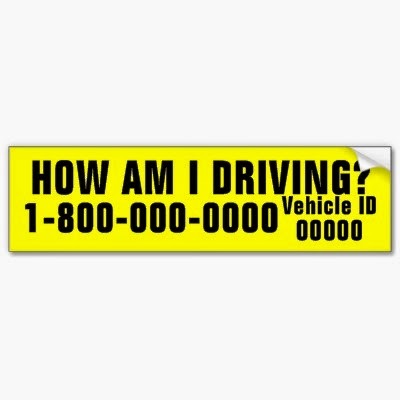 What's Behind the "How Am I Driving" Stickers? Everyone has seen them: you are driving down the interstate and come close to the rear of a truck. In your view the classic "How Am I Driving?" sticker with a phone number below it. Have you often wondered if anyone actually takes the time to call? Who the number belongs to? How reports can affect the truck driver? In this post, we'll address the basics behind this well established "quality control" mechanism. A reddit user, Garbanian, asked the following questions about the popular decals: "How do these impact you as a driver? Are they worth calling for GOOD or BAD drivers? Is this something that can increase someones paycheck, or negatively impact them, or lead to termination somehow?" The number seen on the sticker usually belongs to the trucking company's insurance provider. It can potentially affect the driver in a negative way if it is a complaint; however, positive reports from others on the road are very rare. If it is a complaint, most dispatchers consider the conditions (road, weather) around the time of the incident. Dispatchers are aware of the difficulties (at times) surrounding the operation of a big rig. The complaint "could fall on deaf ears" as one redditor remarked, if it was deemed to have occurred during a difficult driving circumstance. Other truckers claim that they have received complaints for not letting someone merge, through a dispatcher is aware that drivers already on the interstate have the right-of-way. Other common issues revolve around complaints about wide turns and tailgating. The best piece of advice often involves the idea that all drivers should slow down, leave more distance between them and the car ahead and show a little compassion while on the road. Everyone has somewhere (important) to go. If drivers can work together to avoid conflict on the road and "give a little" it can go a long way to keeping the road a happy and efficient place.